It's a been a light week for the old haulage, which is a nice relief. In full disclosure I did finally find the "Collector Diecast" '66 Bat Copter and Dark Knight Rises" "The Bat" but since I'm leaving those carded for easier displaying I've opted not to write them up. Suffice to say both are neat, certainly not $9-neat, though. With that out of the way, pray let us advance to the proper Spoilage. Surprisingly I found a full case of the latest Toys R Us exclusive wave series freshly out and nabbed the exclusives quite sprite-ly! 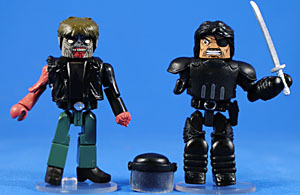 Here we get the Governor in his "Assault" look which makes me need the Specialty Market exclusive 'mates even more now. This is the first 'mate I've gotten in the Riot Gear and it's pretty solid though the peg-holes on the boots are a bit too shallow for the base and the shoulder pads really limit upward posing of the arms. The helmet is nice, though, and has a flip-up visor. 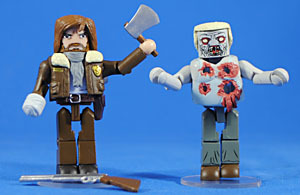 The Biker Zombie is neat, with uniquely sculpted "muscle-y" right arm and left hand-stump. He's wearing weirdly stylish boots which lack pegholes, so his base becomes fodder for past releases. Shaggy Rick is looking pretty good and accurate for that period of the comic (about as far as I've gotten into it). Though it is a bit oversized the sculpted bandage for his hand is much nicer than the previous attempt. He comes with his pistol, hatchet and shotgun but sadly his belt only has a holster for the pistol (and a loose fit at that) but on the upside his scarf is a separate sculpt from his jacket so you got some options there. He comes with "Shot Zombie" what is another somewhat clever execution - he's got a transparent torso then a "fat torso" sculpt over with with holes cut out for see-through action. It's not perfect but it ain't bad and does help make for one of the more unique zombies in the collection. Hasbro yet again attempts to ensure they kill a line by over packing the same basic characters. 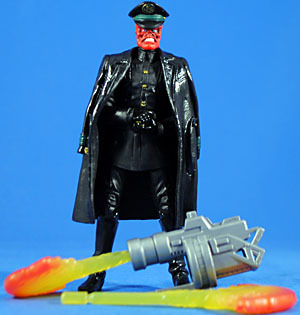 This figure is little more than a repaint of the Movie Red Skull figure, which does mean he has some nice articulation, a semi-odd/inaccurate costume, and he comes with the fire launcher from the Deluxe Hydra Soldier, which is neat but none too exciting. What is exciting is his new head and hat! They sculpted up a nearly perfect head for this classic villain and it is gorgeous! The figure is worth it for the new head alone, but then you get an awesome cap with the Hydra insignia sculpted on it. It too is a beautiful sculpt and though it can slide off with some ease it fits perfectly onto the head. However, I must confess my obsession with this figure is chiefly the result of his remaining accessory... a repaint of Toht's overcoat!!! I love, love, love that accessory. It's absolute fantastic "universe building" and adds a level of realism to this character that is mind-blowingly cool! It was absolute genius to carry it over to this figure! 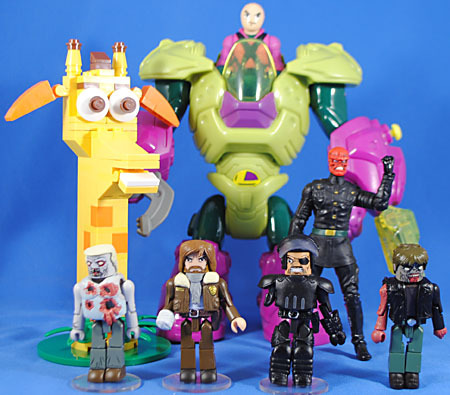 I'm a child of the '80s so I have a fairly soft spot for corporate mascots and thus I was thrilled to all get-out when this polybag set was revealed earlier in the year. I was under the impression it was just a low-run European exclusive until this popped up at a local TRU and I'm all the happier for it. 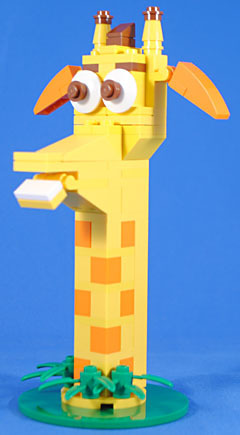 It's a pretty neat build of ol' Geoffrey and is essentially just a bust of the guy. The green disk and foliage is clever design for the base suggesting he's poking his head up out of the canopy rather than being a severed trophy. It's fairly big too, a full 6" tall, and he's got an articulated jaw and ears. This is a super-fun polybag and I'd love to see other companies partner with Lego for similar things (I really wish I got that Target gift card set with the Target dog in it, now)! The barrage of Imaginext continues with with this big old mech suit for Lex. I've only seen this at Walmart so far so I'm not sure if it's an exclusive but at $15 it's certainly a relatively reasonable price. As mentioned before I really love Armored Lex so this was a no-brainer eventuality for my collection. The figure is the same as the carded version but now painted in proper Super Friends colors and is really the highlight of the set. That's mainly because the "cockpit" isn't very deep so that windshield doesn't even reach up to his neck. 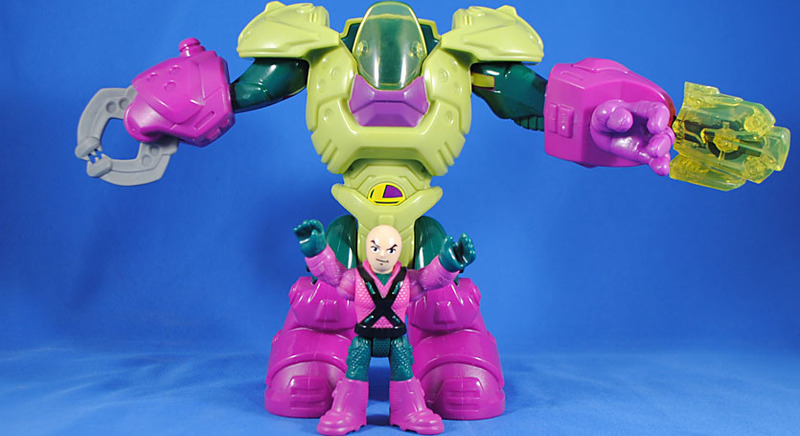 The suit has similar articulation to the figures - T-crotch (though each leg moves independently), balljointed shoulders and swivel wrists, though sadly the shoulders and wrists have fairly restricted movement. The right hand features an articulated claw while the left fires a missile carrying a giant chunk of kryptonite. The kryptonite is a fun idea and decent sculpt but the translucent green is just too light and it ultimately just looks weird. Aesthetically this is a cool set though once open and in hand it's a bit of a disappoint as a toy. This entry was posted in Hasbro, Lego, Mattel, Rustin's Spoils of the Week, TRU and tagged Avengers, Imaginext, Minimates, Superman, zombies. Bookmark the permalink. and that red skull is cool. 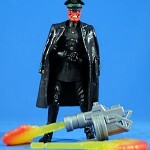 one of the knees on mine was really loose so i popped the head off and put it on my movie red skull; with the coat and hat his greenish makes a nice break up from all the black. i don't collect much 4" marvel but red skull figures are few and far between. 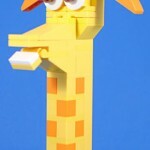 From the thumbnail on the main page, I thought Geoffrey was a yellow Jinjo from Banjo-Kazooie. 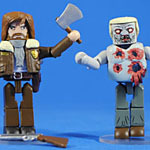 Those boots on the zombie are a reuse from the Hasselhoff minimate that came with KITT, I think. 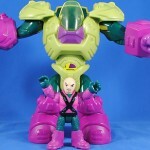 It's actually cool how Lex Luthor's armor is always a good excuse for this kind of toy. He's not like the Joker or the Green Goblin, where putting fighting armor on him would look stupid---you can actually imagine the character spending a ridiculous amount of money to buy something like that. Geoffrey looks the way I look when there's no new Spoils of the Week.